Languages that are at least 80% complete are included with the VueMinder installation and can be accessed via the "Language" menu. Additional languages can also be downloaded below. 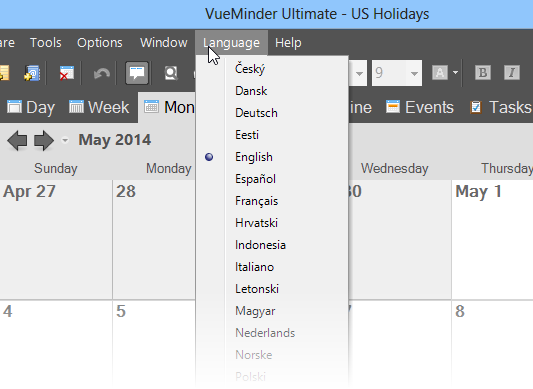 If you help finish a translation that is currently less than 90% complete, you'll receive a free license of VueMinder Ultimate. The following translations are available. Click a language's name to download it. After downloading a language file, extract it to the folder where VueMinder was installed. This is usually "C:\Program Files (x86)\VueSoft\VueMinder". The downloaded language will then appear on the Language menu and can be edited. Do you want to help translate, or is there a language you'd like added? Please let us know.